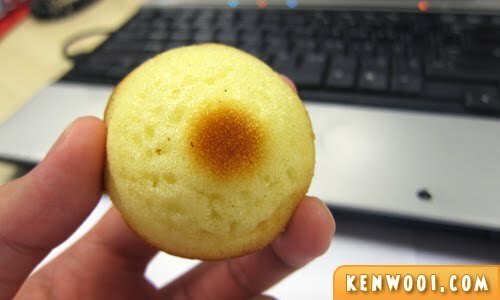 One day, my colleague offered me a tiny cake. It’s from The Lavender Bakery. I accepted the generous offer, and looked at the bite-sized cake. Hmm… it looks peculiar. Because somehow, if I’m thinking wisely, it looks like a body part of the female species. LOL. Ur title says it all? How’s the taste? scratches head too, what does it look like ya? Bet it’s yummy though. NOM! so u got 2 pcs? did the cake have cream inside of it? If it does, the try squeezing it. The cream will shoot out from the middle part.